I saw this recipe floating around on the internet somehow and quickly bookmarked it, so that I would be able to use some of my eggplant to make these chips. I always love it when I see unique ideas that use vegetables I love. I made these for lunch one day last week and they were really tasty. I had a few problems getting the chips to crisp up, so I adjusted the oven temperature to 400 degrees F, and had to cook them for a little longer than called for. I also got a few slices that were really loaded with paprika, so next time I make them I think I will sprinkle the seasoning on after the olive oil is lightly coated onto the eggplant slices. This recipe does take a little bit of time, so make sure you read the entire recipe before you begin. 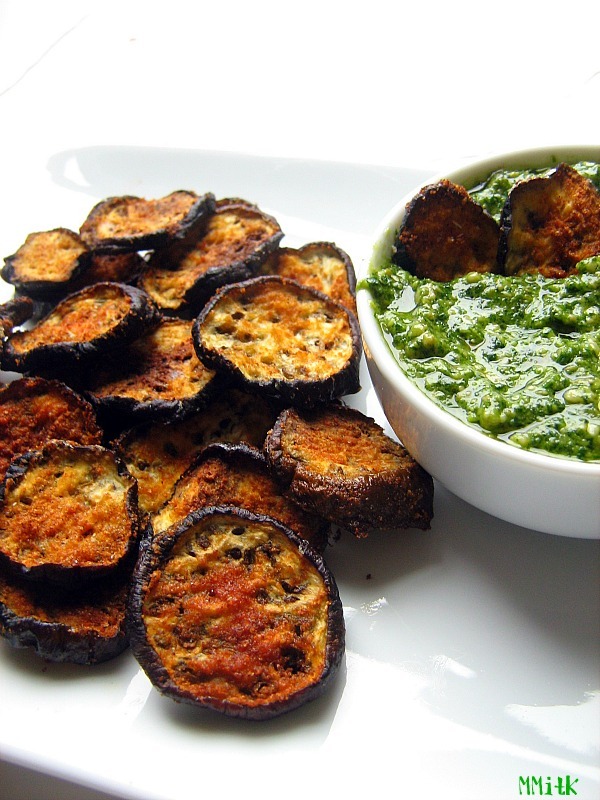 The eggplant slices need to be salted and then sit for an hour, but that is when I decided to make the pesto sauce. There was enough pesto leftover to use on some pasta later in the week and it was delish! Thanks for this one. Always looking for ways to use the eggplant from the garden. I know I am making!